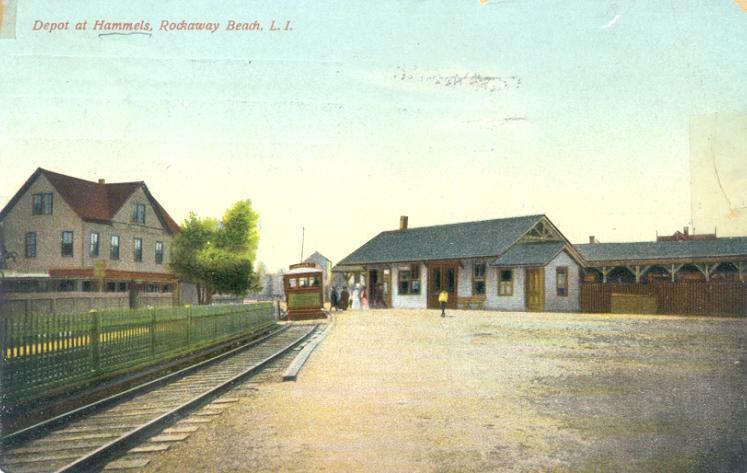 ON JUNE 25, 1881 THE LONG ISLAND RAIL ROAD INAUGURATED A SEASONAL RAPID TRANSIT SERVICE BETWEEN FAR ROCKAWAY AND ROCKAWAY BEACH VIA THE FORMER SOUTH SIDE RAILROAD ROCKAWAY BRANCH TO NEPTUNE HOUSE. 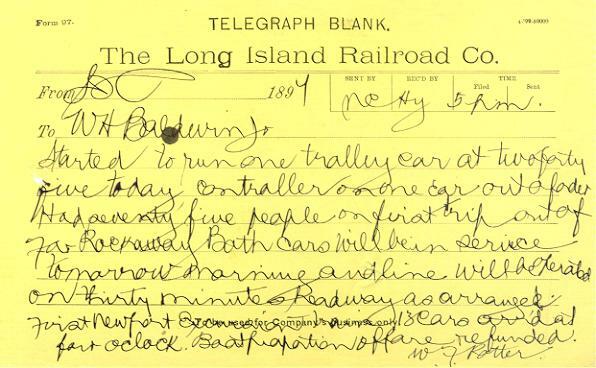 ON JULY 4, 1888, A NEW TRACK CONNECTION HAVING BEEN MADE, THE SERVICE WAS EXTENDED TO ROCKAWAY PARK. 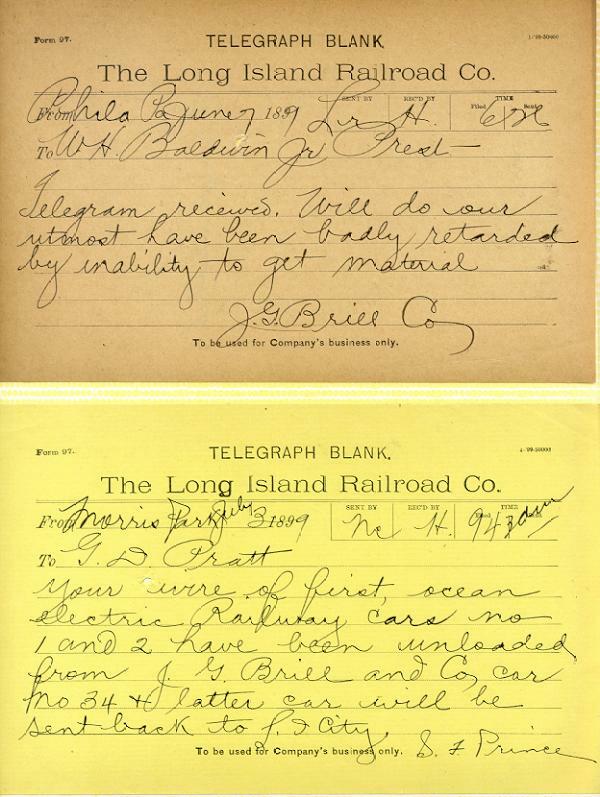 THE LONG ISLAND RAIL ROAD'S FIRST ELECTRIFICATION. 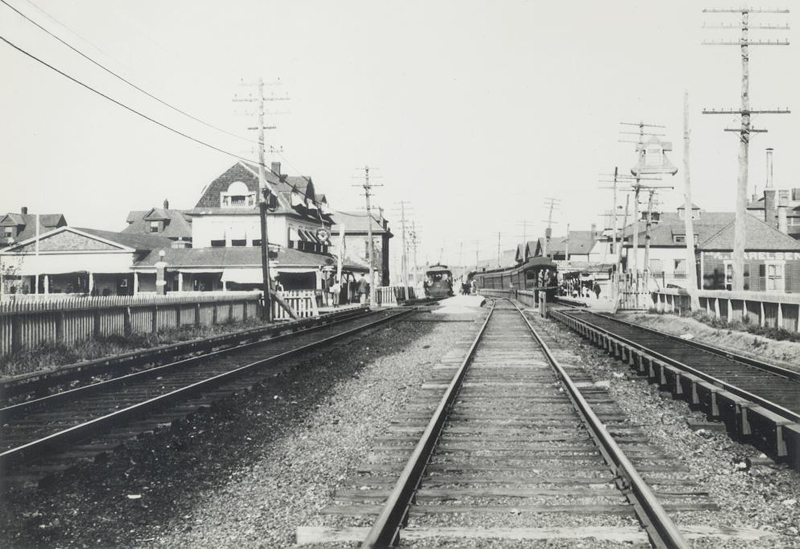 IN JUNE 1904 A THIRD (MIDDLE) TRACK WAS BUILT BETWEEN FAR ROCKAWAY AND HAMMEL AND TROLLEY CARS BEGAN RUNNING IN THE STREET FROM FAIRVIEW AVENUE, HAMMEL TO ROCKAWAY PARK. 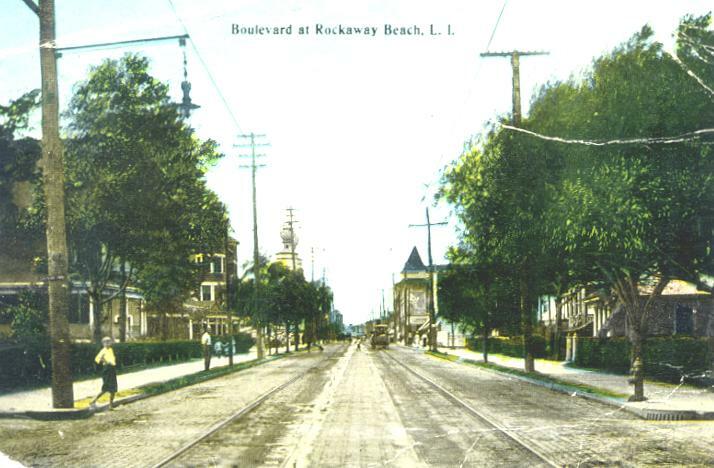 BY OCTOBER 1905 THE OUTSIDE TRACKS WERE FITTED WITH THIRD RAILS AND ELECTRIC TRAIN SERVICE BEGAN TO FAR ROCKAWAY. 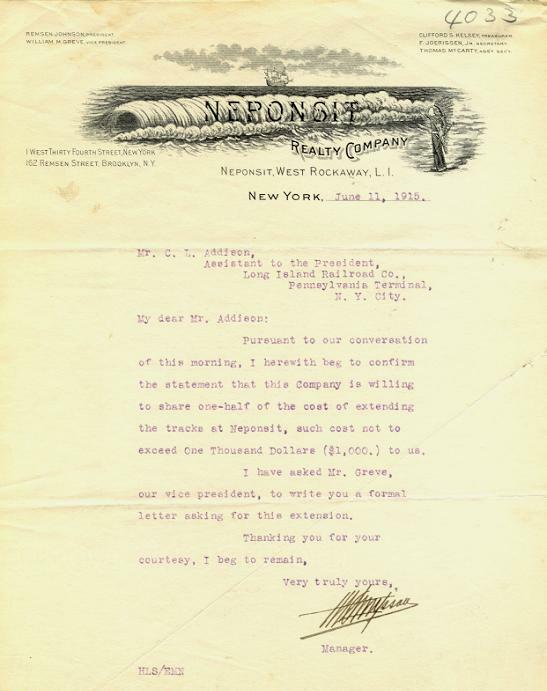 IN 1910 THIRD RAIL WAS INSTALLED ON THE MIDDLE TRACK FOR THE NEW PENN STATION SERVICE. 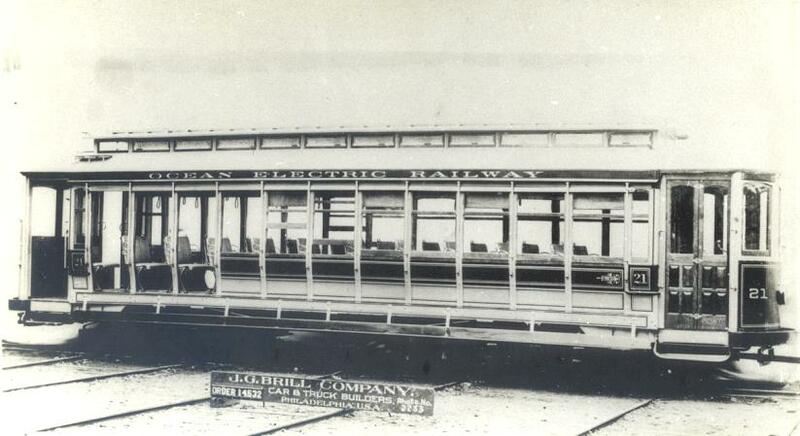 THIRD RAIL SHOES WERE INSTALLED ON THE TROLLEY CARS AND IN 1911 THE TROLLEY WIRES WERE TAKEN DOWN. 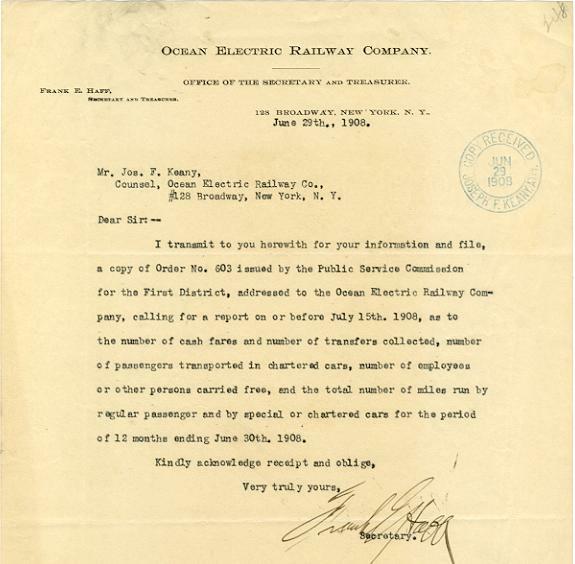 BY 1915 OCEAN ELECTRIC SERVICE WAS EXTENDED TO BELLE HARBOR AND NEPONSIT. 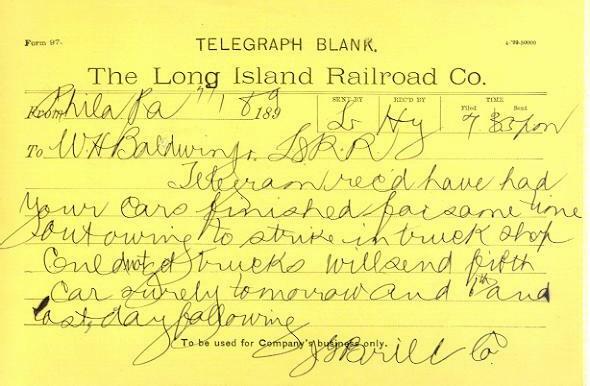 JULY 23, 1899 - "TROLLEY AT FAR ROCK NOT READY TO RUN; MAY BE IN SHAPE THIS AFTERNOON. 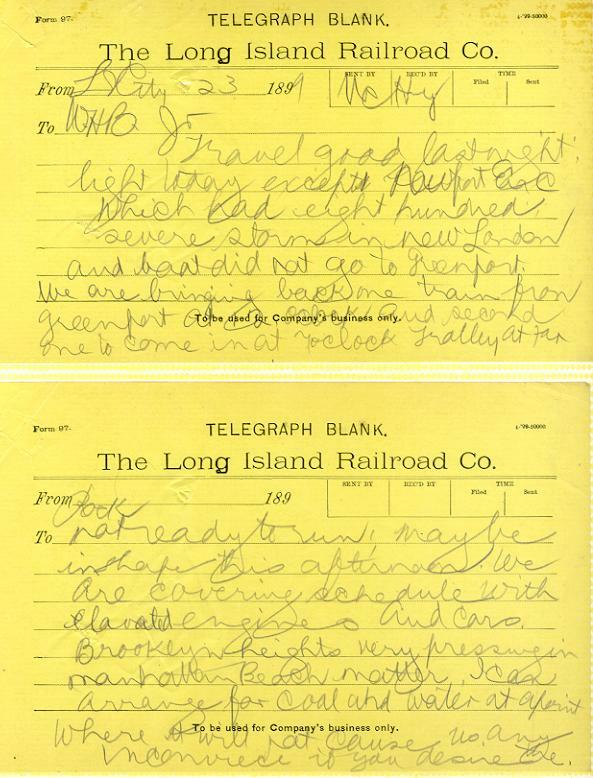 WE ARE COVERING SCHEDULE WITH ELEVATED ENGINES AND CARS." 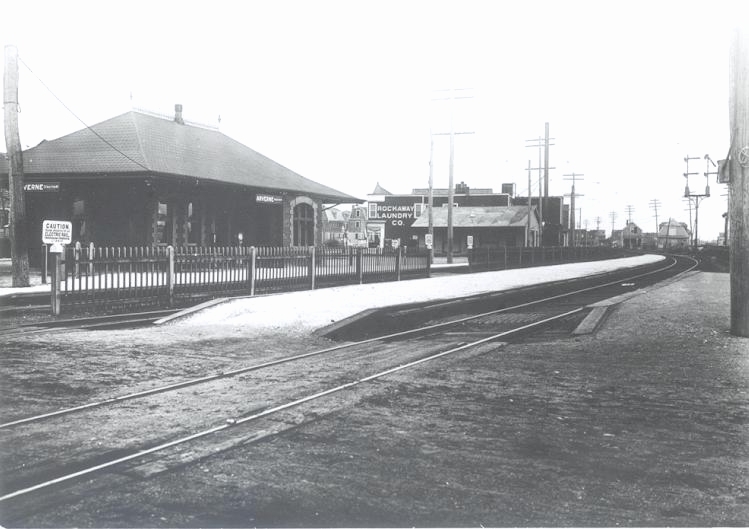 AND LINE WILL BE OPERATED ON THIRTY MINUTES HEADWAY AS ARRANGED"
TROLLEY WIRES ABOVE OUTSIDE TRACKS REMAINED UNTIL 1911. 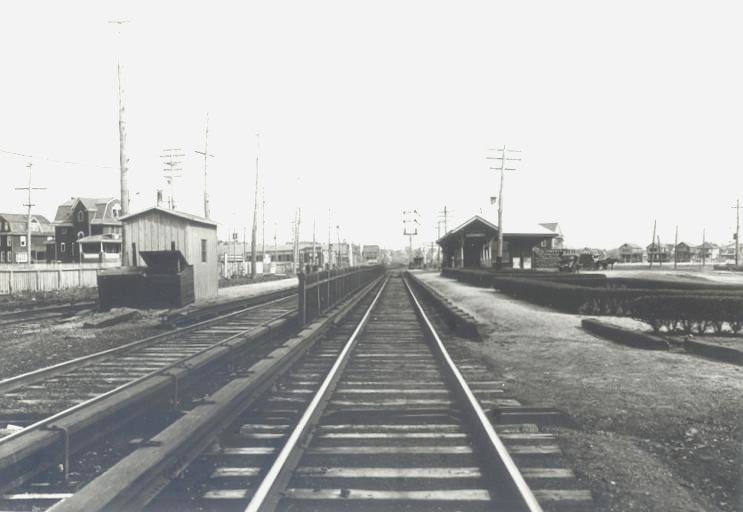 LOOKING GEOGRAPHICALLY EAST TOWARD ARVERNE STATION BETWEEN 1905 AND 1910. WITH A NEW TOWER - "HU" - AT THE EAST LEG OF HAMMEL WYE. 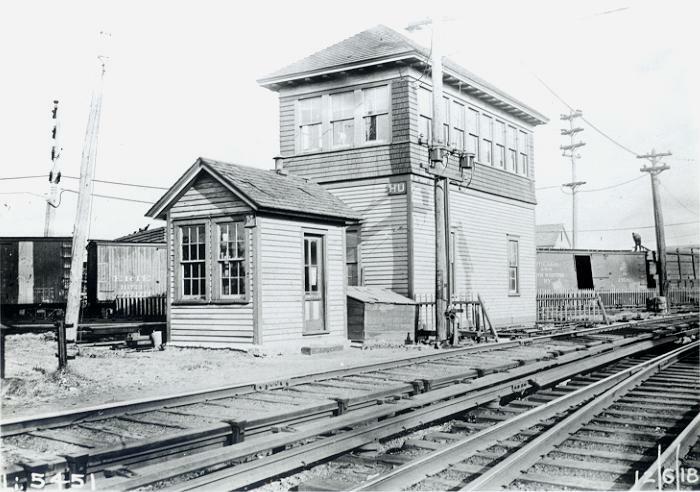 "FX" TOWER AT FAIRVIEW AVENUE WHERE TROLLEYS ENTERED AND LEFT THE L.I.R.R. 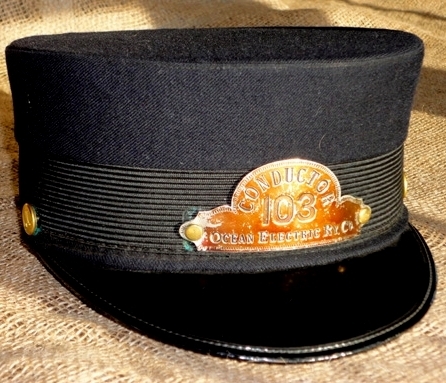 TRACKS. 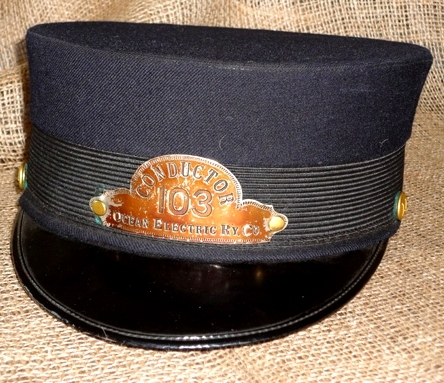 CAR NUMBER 30 HAS ITS TROLLEY POLE RAISED FOR THE TRIP TO NEPONSIT. 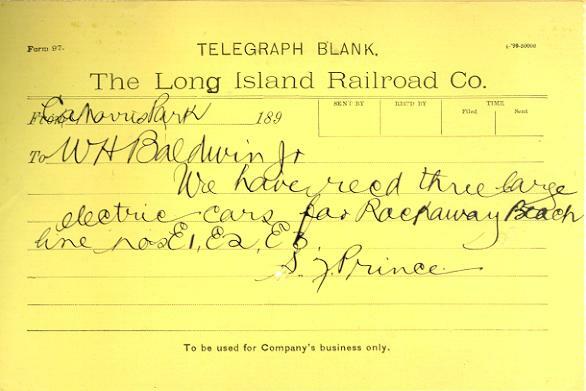 NUMBER 7 IS OPERATING TOWARD FAR ROCKAWAY WITH THIRD RAIL SHOES. 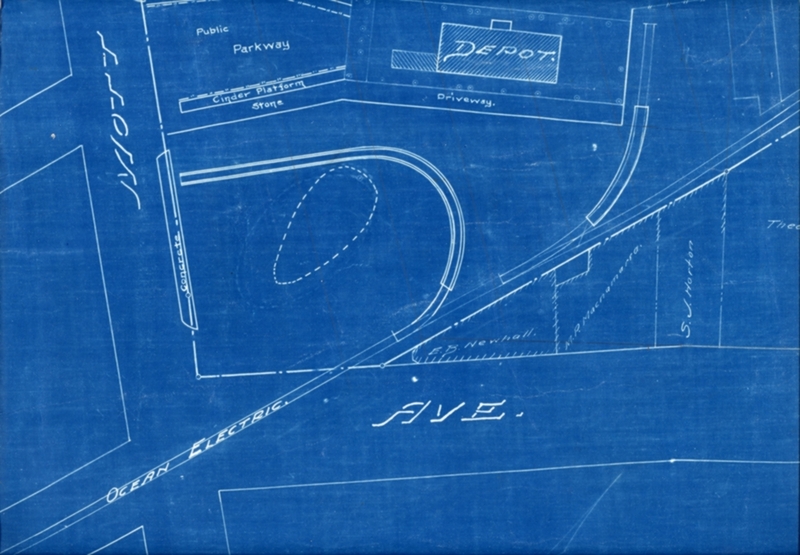 IN 1915 THE TRACK AT NEPONSIT WAS EXTENDED 600 FEET. 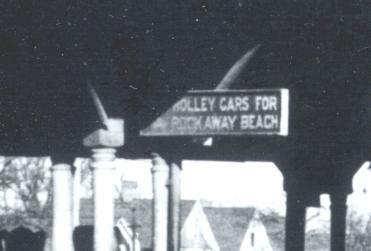 IN 1905 AND EARLY 1906 TROLLEY CARS AND TRAINS CONNECTED AT FAR ROCKAWAY.